Ashesh Mehta, MD, PhD, performs laser ablation at North Shore University Hospital. The Feinstein Institute for Medical Research is the first on Long Island to enroll patients suffering from epilepsy into a clinical trial testing if they can be treated with laser ablation, which allows clinicians to monitor the destruction of diseased tissue in real-time. The laser ablation being tested is an MRI-guided laser ablation system called the “Stereotactic Laser Ablation for Temporal Lobe Epilepsy” (SLATE). The use of SLATE – produced by Medtronic’s Visualase® – allows neurosurgeons to simultaneously deliver, monitor and evaluate the effectiveness of thermal energy during MRI imaging. 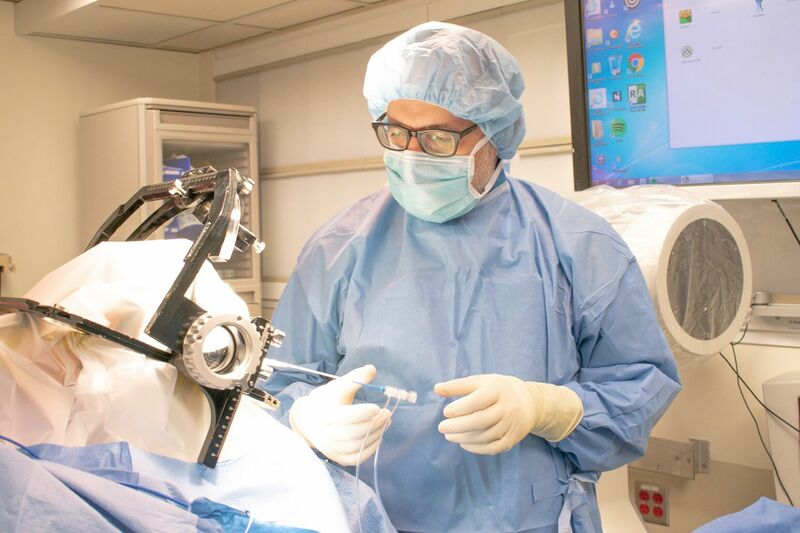 In this minimally-invasive procedure, a laser device is inserted into the brain through a one-quarter inch incision and delivers energy produced by the laser to heat and destroy the diseased, seizure-producing tissue deep within the brain. This multi-centered clinical trial aims to test the safety and efficacy of the Visualase system for the treatment of epilepsy patients. The Visualase system has already been cleared by the U.S. Food and Drug Administration (FDA) for use in neurosurgery, but is considered an investigational device for people with drug-resistant mesial temporal lobe epilepsy (MTLE). The treatment is focused and MRI temperature maps provide the neurosurgeon with a real-time view of the diseased tissue being destroyed, without damaging healthy tissue. The laser device is then removed and the incision is closed. A 22-year-old female from Valley Stream, NY, was the first patient to benefit from the SLATE procedure at North Shore University Hospital in Manhasset. The surgery took place on February 13 and was performed by Dr. Mehta. Participants in the SLATE trial will be followed for one year after their laser ablation procedure and evaluated for seizures, other adverse events, neuropsychological outcomes and quality of life. For more information about the SLATE trial at Northwell Health’s Comprehensive Epilepsy Center, contact Denise K. McDermott, RN, CCRC, Neurosurgery Research Nurse at 516-562-2926.